Over the course of the school year, Bert Corona Charter School students have had the privilege of working with Siobhain O’Reilly-Hill from Children Mending Hearts. Children Mending Hearts is an organization whose goal is to empower the youth by providing educational programs that build empathy and global citizenry. As a result of this collaboration, students were able to participate in workshops that supported feeding the underprivileged, creating bookmarks to support literacy, and empathy training. 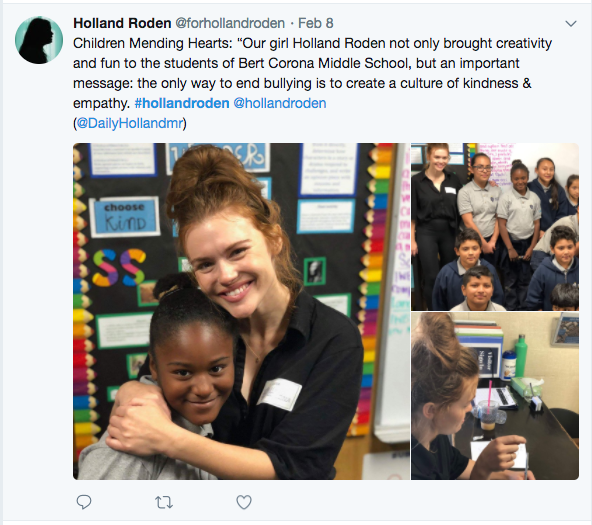 Children Mending Hearts also provided our students with the opportunity to meet Holland Roden from Teen Wolf, https://www.instagram.com/p/Be-LyYBF2DY/. She provided our students the opportunity to participate in a teambuilding empathy activity, Q and A session, and provided our students with a photo opportunity. https://www.instagram.com/childrenmendinghearts/ gave our students, thanks!